Cast Seven Years' War semi-flat 40mm scale metal Austrian Cuirassier riders from this rubber mould. The riders that can be cast are the cuirassier officer and standard-bearer. This is compatible with PA3120 Cuirassier Horse mould. The PA3122 mould allows companion riders, Trooper and Trumpeter to expand on this range. 2 PTFT rods are included with this mould to place in the neck of the bodies before casting. This creates space for the heads to be fitted after casting. They are reusable. Watch our video on casting from these moulds. Two copper rods are also included. Use one as a pole to wrap the flag around (flag sheet included). Cut rod if needed to 60mm in length. Go to the Seven Year War Austrian subcategory page for historical details. Use 4 clamps instead of two (or use more elastic bands than normal). Space the clamps on the upper and lower quarters of each side of the mould when securing the mould. Venting for these riders should not be needed if you use Model Metal. However it can be helpful if you find you are having difficulty. Learn more about venting from this video. 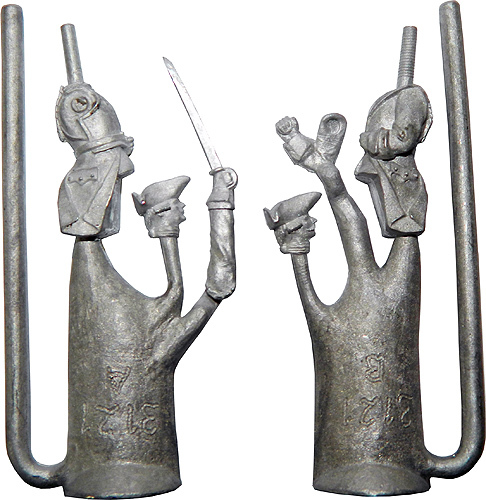 Mould 3121 Austrian Cuirassier Officer and Standard bearer casting. Austrian: 16th (De Ville) Cuirassier Regt spare flags (pdf). Austrian: Cavalry 3120 - 3121 - 3122 Painting Guide (pdf). Click the button below to add the PA3121 Seven Years War Austrian Cuirassier Officer and Standard bearer 40mm Mould to your wish list.